Today is my sisters birthday so I'd like to start this post by saying Happy Birthday to my big sister Shelley. She is part of the reason I'm one of the happiest girls in the world. She always has my back, we have a blast raiding our moms closet and blaming it on each other, and most of all she has blessed me with the 2 most incredible little nuggets an "Aunt KiKi" could ask for. Ok, on to the food! 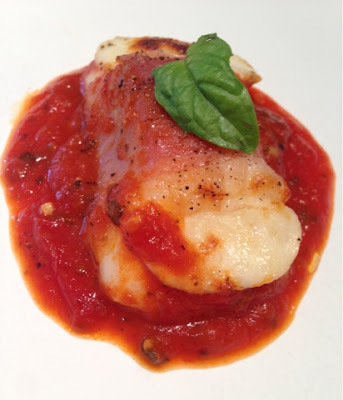 I have been to two restaurants recently that have served some form of baked mozzarella wrapped in prosciutto or bacon. What's better than a price of cheese wrapped in salty yummy pork? Nothing, it sounds just like heaven to me. This recipe is my take on those dishes and let me tell you, I recently made three batches of these, took them to a sweet friends birthday party and set them out as an appetizer and they disappeared like a hot box of Krispy Kreme's. If you don't know what I mean by that then just stalk a Krispy Kreme until the red sign lights up and go buy a dozen....I bet they don't make it home. I chose to create this dish in honor of my main bass guitar playing wild man CJ Wilder as it was recently mentioned as one of his favorite appetizers, and who could blame him? I hope you guys (and girls) dig it too. Preheat oven to Broil. Cover the bottom of a casserole dish with marinara. 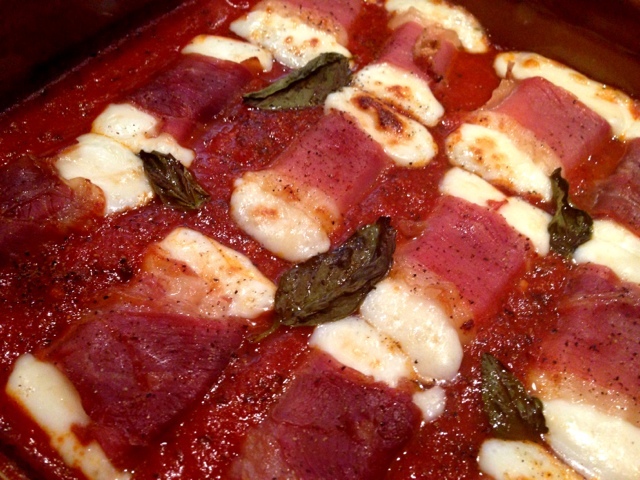 Wrap each 1 oz piece of mozzarella in prosciutto and lay flat in the casserole dish. Place in the oven and let broil for 10 minutes. remove from oven and let cool for 3-5 minutes or until mozzarella begins to firm back up a little. Garnish with basil and serve warm. I put a basil leaf inside the roll. Yum!